Cola is a genus of trees native to the tropical forests of Africa, classified in the family Malvaceae, subfamily Sterculioideae (or treated in the separate family Sterculiaceae). 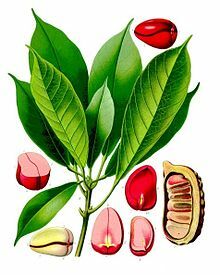 Species in this genus are sometimes referred to as kola tree or kola nut for the caffeine-containing fruit produced by the trees that is often used as a flavoring ingredient in beverages. The genus is related to the South American genus Theobroma, or cocoa. They are evergreen trees, growing up to 20 m tall (about 60 feet), with glossy ovoid leaves up to 30 cm long and star-shaped fruit. Cola is a genus of the family Malvaceae with approximately 100 to 125 species occurring in the evergreen lowland and montane forest of continental (primarily tropical) Africa. Cola nuts are seed pods of the plant harvested primarily from the species Cola nitida and Cola acuminata. Outside mainland Africa, some species are cultivated for their nuts in Brazil, Jamaica and elsewhere in the humid tropics. ^ a b Cheek, Martin (2002). "Three new species of Cola (Sterculiaceae) from western Cameroon". Kew Bulletin. Royal Botanic Gardens, Kew. 57 (2): 403. doi:10.2307/4111117. JSTOR 4111117. Wikimedia Commons has media related to Cola. This page was last edited on 20 October 2018, at 04:42 (UTC).